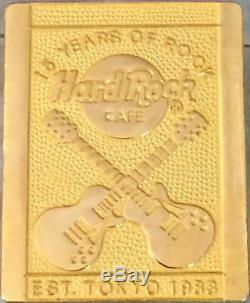 HARD ROCK CAFE TOKYO July 4th, 1998 15th Anniversary. STAFF EXCLUSIVE Lapel Pin Badge! Gold Rectangle with Crossed Guitars! "15 Years of Rock" & EST. Rare Limited Edition of Only 100 Made! Gold base metal pin is 2" x 1 5/8", clasp back. 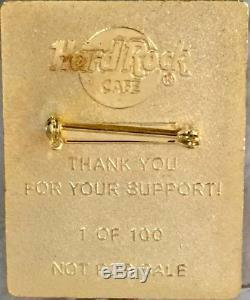 THIS HOT PIN is a great LIMITED addition to your HARD ROCKIN' Pin condition! 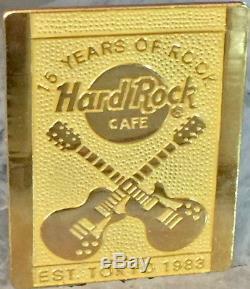 The item "Hard Rock Cafe TOKYO 1998 15th Anniversary Gold STAFF PIN Rare LE 100 HRC #10181" is in sale since Saturday, July 14, 2018.